I didn’t end up playing a Friday evening LARP, which was unusual for me. My first LARP was one of the late additions to the schedule, But Not Tonight, which ran on Saturday afternoon. But Not Tonight is a freeform LARP that was described to me as “The Breakfast Club,set in a fallout shelter”. Through the workshop, players create characters by choose a formal and informal name, a clique, a keyword, a grade, a wound (a problem they’re struggling with), a gift (a strength that helps them address problems), and positive and negative relationships with the other students and the guidance counselor (also a player). For my wound, I chose “having an affair with a teacher” because it seemed the most interesting, but later I found it difficult to steer my character in the direction of revealing the details and/or discussing it in depth, particularly with the guidance counselor present, for fear of getting the teacher in legal trouble. (In retrospect, I feel I should have steered harder towards not being concerned about that particular consequence, both for my own sake, and for the sake of the experience of the guidance counselor, and another player playing the teacher’s nephew.) I also found it somewhat difficult to use my character’s gift — being outspoken for what she believed in — in a way that didn’t feel contrived. The highlights of the LARP for me included the game of Truth or Dare, which was basically a series of prompts for good roleplay — either to reveal secrets we had already determined, or a fun way to come up with new ones on the fly. (I think this is a good sign for an upcoming weekend long LARP which will likely involve a lot of ice breaker/sleepover type games.) I also really liked the way But Not Tonight cleverly simulated a montage of time dragging past, and the little moment when we discovered twinkies and tang in the school fall out shelter. An interesting thing about this sort of freeform LARP, where characters are created through workshops before play, is that they’re very open to replay, and they might even potentially be better the second time around, as players can make more informed decisions during the workshop to lead to the kind of play they hope to have. It’s probably also often easier to figure out how to successfully steer (that is, positively metagame) for dynamic roleplay. I was cast as the mysterious Fisherman’s Wife. I was very excited about this character when it came through email; it seemed like a lot of fun, with some very interesting roleplaying challenges and a nice opportunity to re-wear the costume I put together for an NPC role at Musica Universalis, with its long dramatic veil. (I even soaked my hair in a sink a few times during the LARP, just as I did for MU — you never realize just how quickly hair dries until you want it to stay wet.) It’s a very spoilerable sort of role so I won’t say too much more here, other than it was just as fun as I expected it to be, and definitely the role I would have picked for myself, were I asked to self-cast knowing everything I know about the LARP now. Highlights of the LARP included a play performed by two characters just before the end, in which they told the story of much of their time in the town, and a poem written and read by another character. I think if players are up for it, more LARPs should include performances, whether its music, dance, poetry recital, or theater. Part of the play included me as a participating audience member tossing (nearly empty) cups of water in the actors’ faces (at their instruction). It was a recreation of a moment from earlier in the LARP, in which I tossed cups of (entirely imaginary) water at them. It seems like such a little thing, but I thought it made for a nice, dramatic bit of showy roleplay. We shy away from things like this in LARP, in part because we often avoid exaggerated expressions of negative emotions (though in this case, my character was not expressing a negative emotion, she was trying to be helpful), but more practically, (and entirely reasonably) we avoid creating even minor physical discomfort (or risking damaging costuming.) Of course, this is the kind of thing that requires pre-negotiation, but it’s such an easy way to create instant drama, I’d like to keep it mind for future LARPs. One odd observation — even though the LARP was explicitly set in Massachusetts (and nearly all of the characters were locals), I noticed a number of LARPers affecting a Southern drawl. On Sunday morning, I was signed up to play a LARP mysteriously labeled ????? on the schedule. The blurb for the LARP was originally also ???? ?, but later updated to reassure people it wasn’t an error, but was in fact a LARP intentionally labeled and described with question marks. And it filled, which I think says something about this community and its eagerness to LARP, along with how it values surprise in LARP. However, upon arrival on Sunday morning, I found out the LARP had one extra player, and so I agreed to NPC instead. It turned out to be a wacky LARP about random characters from history and literature playing a bizarre, chaotic, and poorly managed game show in Purgatory. I played random harried stage hands, confused but enthusiastic studio audience members, and later some vague authority figure closing down the whole affair. I found some large paper bags in the classroom where we ran, and with some board markers, created impromptu signs cheering on the different players while in the role of the audience. After ???? ?, it was time for Spellbound! a LARP from the New Zealand community inspired by supernatural 1960s sitcoms (specifically, Bewitched and I Dream of Jeannie), along with a bit of Stepford Wives and Mad Men, set at a Thanksigving dinner. I’m not a terribly experienced GM, so I was a little nervous about running it, but the writer was very nice and patient when answering my questions over email, and casting worked out such that I didn’t feel there were any characters that didn’t fit the corresponding questionnaire responses. In prepping for the LARP, I had fun making a little bit of set decoration and props. I pulled some vintage Thanksgiving art off of the internet and made some cards. I also put together an ad that had been produced by the advertising company that two of the characters work for. And I had fun decorating two green bottles, one large, one small, with nail polish, gold paint pens, and stick-on gems. Since I didn’t manage to obtain a rat prop, I pulled an image off the internet, printed it, and cut it out. I think the props worked out well. At the start of the LARP, the family started inside the main game space, and I had the guests enter in the order I thought would most maximize awkwardness and tension. And during the run, I pulled up an audio clip of a laugh track and played it on my phone whenever someone had a good quip and the moment felt right. Since the LARP is set at a Thanksgiving dinner, we ended the LARP by having everyone sit down and say what they’re thankful for. Most players went for a heartfelt sentiment rather than a quippy remark, so I quickly pulled up a sound effect of a studio audience saying, “awwww….” and played that after the various remarks. If you’d like to run Spellbound!, it’s available on DrivethruRPG. I failed to get any photos of my most difficult LARP costuming project to date at Intercon S, where it was debuted for the A Song of Ice and Fire LARP, Dance of the Dragons. Then the dress ended up in a friend’s car, where it languished while I repeatedly failed to make arrangements to retrieve it, and so was unable to included even belated photos in my blog post about the LARP. But I think I managed to make up for it! There was recently a promotional event in Boston at an AT&T store, where people got to take photos sitting on a replica of (the TV show version of) the Iron Throne, and then with Kristian Nairn, the actor who plays Hodor, in front of a replica of the cave door (complete with undead bursting through.) He was rather gracious when I sputtered out something about being a big fan. There were also two costumes on display in the store, one worn by Ned Stark, the other worn by Bran Stark, as well as an AR (augmented reality) demonstration where one could put on an AR set and wave a torch at wights and slay an Other that comes bursting through the wall. Most people attended in normal clothing, or Game of Thrones licensed t-shirts. I showed up in my homemade Targaryen dress with two friends – one of the writers/GMs of Dance of the Dragons, who borrowed my Tyrell cloak, and the other was the player who played Qoren Martell, whose costume was an Oberyn Martell cosplay ordered off of Etsy. Sadly, the dragon appliques have come off the upper parts of the sleeves (one may be lost). I need to replace those, and sew folds into the sleeves so they’re not dragging so far past my hands. And I look a the way the black textured fabric reflects light and wonder if I shouldn’t have picked a less shiny fabric. Still, I did receive a lot of compliments and requests for photos, which is reassuring. I hope I’ll have more opportunities to wear the dress sometime. The creation of that costume was a saga unto itself, one I could probably write several pages about. Suffice it to say, it started out smoothly but pretty quickly went downhill, and became possibly my worst sewing experience to date. It involved tracking down fabric after finishing the bolts, and lots of seam ripping, especially with the zipper. I knew the sewing pattern was probably above my skill level when I started, and I managed to make some choices, including fabric choices and minor alterations that made it that much worse. Despite my nice early headstart, I only just finished a couple of days before the con. The waist and sleeves in particular have some issues, but some of that is covered by a belt I found online at the last minute. Sadly, I don’t currently have any photos to share. I didn’t manage to get any at Intercon, and the dress has been sitting in a friend’s car since the end of the con. I will try to take some photos to share soon. I also made the banners for set dressing for Dance of the Dragons. This project was large but simple, so it was pretty time consuming, but at least most of it went smoothly. I spent most of the two hours between Kingsword and Dance of the Dragons helping set up, mostly hanging said banners and decorating the godswood, before rushing to get into costume. I didn’t end up wearing a wig, a decision I agonized over in the months between getting cast and playing, but I did wear purple contacts. I think the set dressing of this LARP overall deserves a mention — besides the banners, and the godswood, with its weirwood and draping leafy vines, there was the sept with images of the seven gods and candles, a table bearing drinks labeled “Arbor Gold” and “Dornish Red” and even “Shade of the Evening”, wall coverings designed to look like stone walls, and even an Iron Throne made out of an Adirondack chair. From there until the end of the LARP, I was busy, busy politicking, busy flirting and trying to seduce the heads of other Houses (particularly Greyjoy and Martell) to the Queen’s side, busy trying to help my twin sister hatch an egg or claim a dragon for her own, busy trying to sort out my complicated feelings about my family and my betrothed. I might have gone on more quests (which mechanically were structured like mini-choose-your-own-adventures, but I didn’t have much spare time. I also had my own personal agenda, which wasn’t explicitly written into my character — I wanted to prevent as many deaths of dragons as possible, though the LARP is based around the war where the population of dragons was greatly diminished, which lead to their extinction. From the start of the LARP, I was pushing for an armistice among the dragonriders, which I honestly didn’t expect to succeed, but it did, and I’m wondering how much impact this had on the progress of the civil war in our run. It’s true that wars in LARP, in the hands of PCs tend towards peace, but I’m honestly not certain if our run was headed that way anyway, or if I pushed it in that direction. I found I really enjoyed playing one of a pair of twins. On casting questionnaires, when asked about traits I’d like to portray, I often put something akin to “feels extremely protective towards one or more other characters,” which was a mutual feeling between Baela and her twin Rhaena. I found it easy to follow the examples of playful banter in our character sheet and play off one another, and it was a lot of fun to make sacrificial gestures for her, and threatening anyone who might make her unhappy. I didn’t end up interacting with the mechanics much, particularly the ones involving the various boards (the war board, the boards indicating who had control of King’s Landing and who had control of the Narrow Sea), the system for mustering armies, or the brokering alliances through marrying NPCs to one another. Heads of various Houses had envelopes representing unwed NPC relatives or bannermen, of varying status. Arranging marriages between them enabled people to open the envelopes and access various benefits, which were often the ability to muster additional armies, but occasionally provided other benefits. From what I hear, people enjoyed the politicking around that system. I did engage with the quest system a little. The writers reused the popular quest mechanic from Kingsword, which enables small groups of players (in this case, usually three) to go off on little adventures, represented by small choose-your-own-adventure style texts. Most choices had some sort of requirement (an item, a skill, a title), some lead to different rewards, and failure occasionally had penalties. I fought a rogue dragon rider and helped my sister claim a dragon of her own on quests. There was another fun little mechanic centered around the Iron Throne — in the books, if someone cuts themselves on the Iron Throne (which is made of the swords of vanquished enemies), it’s considered a poor omen for their suitability/right to rule. Everyone time someone sat on the throne, they had to draw a card from a deck, and drawing a red card meant the throne had cut you. It was a nice little bit of flavor. The intimacy mechanic from Thicker Than Water reappeared — players could go over to a the “Street of Silk” table where there were boxes of chocolates; sharing them represented intimate encounters. Players like that it’s evocative and fun without being overly awkward. Dance of the Dragons was everything I wanted it to be as an A Song of Ice and Fire fan; it ranks among my favorite theater LARP experiences. I’m looking forward to helping run it in the near future (or possibly replay it!) I hear there’s already been a request from the New Zealand community to run it at one of their conventions, though I think thus far the only LARP by this team of writers to be run without one of them is the Consequences run of Stars of Al-Ashtara. If there’s anything I can do to get this LARP boxed, I will. This past weekend, Dice Bubble 2019 ran in Troy, NY. But instead of running on RPI campus, as both it and Time Bubble have always done in the past, it ran at hotel near campus, in the function rooms on the lowest floor. This does mean the event can no longer be free, and there can no longer LARPs on Friday evening (without increasing the price by a huge amount), but it does have significant advantages, besides nicer spaces for the LARPs. Though it becomes less accessible to those who can’t afford it (though there were discounted rates for students and GMs), it becomes more accessible to people who find it difficult to around the rather hilly campus (the usually building has a particularly long steep climb from the nearest parking.) It also enables the staff to not have worry about the campus’ rules and bureaucracy, and creates more of a sense of community, as attendees can eat and sleep in the same building where they’re LARPing. I did notice a shift in demographics that resulted from the change of venue and prices — there were a number of attendees who hadn’t been to recent Bubbles (or possibly any) who likely were attracted by the nicer spaces and more physically accessible location, while the number of current students dropped, as did the number of attendees overall. Dice Bubble is also now using Intercode 2, the new web application developed for Intercon, which worked smoothly. I signed up to play five LARPs at Dice Bubble. The first was Innsmouth Tourism Board, a LARP in which the players play the members of a tourism board of a small New England town… where a cruise ship has struck Cthulhu, causing the boat to sink and the elder abomination to return to slumber. Now the townsfolk are pissed and the tourism board has called an emergency meeting to address the issue. Each of the characters is their own comedic take on a Lovecraftian tropes, with their own proposals for how to raise money and appease the town (and pursue their secret nefarious agendas), and there are of course sanity mechanics mixed in. We managed to pass every single proposal, and probably brought disastrous ruin on the town, if not the world. I had a fun time with this LARP. It was a rather chaotic meeting, so I did often find it difficult to get my voice heard at the meeting (and, in fact, I didn’t get my proposals on the table until the GM sort of prompted the group to give me a chance to speak)… and I think possibly including some sort of bylaws or guidelines (particularly for the chair of the meeting) could possibly address this issue… but the situation is humorous enough and the structure keeps the conversation flowing so well that it didn’t bother me at all. I had fun just listening, occasionally bursting into hysterical laughter as my sanity dropped, and occasionally trying to take a little bite out of the poor professor sitting on my left. Innsmouth Tourism Board reminded me a lot of Dungeon Owners Association, a LARP about a homeowners association meeting among the evil denizens of a typical Dungeons and Dragons style dungeon, and Plan Eight From Outer Space, a LARP about aliens at a post-mortem meeting for a plan to stop Earthlings from destroying the universe that went terribly wrong. I think one could say that the “wacky board meeting” is a LARP genre unto itself, and it’s one with a lot of legs — that is, one could easily take the bare bones structure, change around the flavor and specifics, and come out with lots of different short comedic LARPs. My second LARP of Dice Bubble was Who Killed High Hat, and this was the only LARP I did any costuming for this weekend. (Rather unusual for me!) High Hat is about the family that owns a racing horse, along with their guests, gathered in a VIP bar at the racing track, trying to deal with the suspicious death of their prize horse. As advertised, it’s a darkly humorous game about terrible, selfish people who probably will learn nothing from the experience. I enjoyed playing up our dysfunctional family dynamics — I think the best bit was my husband’s ex-wife throwing her drink in my face. I also really liked the drinking mechanic, which involves drawing the top index card off of your personal deck each time you have a drink. The cards have simple instructions for ways to blurt out secrets and/or offend people, and keep the squabbling and tension going. I would love to see that mechanic make an appearance in more LARPs. After High Hat, I played Did I Fall Asleep? a freeform LARP about the relationship between identity and memory. I’m not sure if it’s directly inspired by the tv show Dollhouse, but it involves a concept similar to one in the tv show, where people have contracts with a company that can completely overwrite one’s memories and personalities. The players all start in a waiting room, as an employee takes them out one by one to offer to restore their memories, or renew their contract. Despite having zero information on our characters to begin with (and many of us spent a significant percentage of the LARP without information), our situation provided fodder for tense conversation. Could we trust the company? How could we know if they were lying to us about what our original memories were? What if our old lives were awful, and that’s why we chose to temporarily escape them? Our conversation went in anxious circles. Oddly, the fact that the GM was out of the room, conducting one-on-one scenes with each player was a really positive aspect of my experience in this LARP. I’ve come to realize that one of my least favorite aspects of LARPing is when I’m not sure what my character should be doing, and I worry a GM is watching me and wondering why I’m not engaging in the LARP the worked so hard to run for me. My character in Did I Fall Asleep? was often frustrated with the conversation, feeling as though there was no possible practical outcome to speculation, and often lapsed into brooding silences. When another player prompted us to lie down on the floor, to shake up the situation and possibly make ourselves more comfortable, I moved to the floor… and even drifted off once or twice during the LARP. I’m embarrassed to admit this isn’t the first time I’ve fallen asleep during a LARP (when that wasn’t meant to be part of the experience) but this time I didn’t feel like I was possibly upsetting a GM or denying players the opportunity to interact with my specific character… as all of the characters, prior to receiving their memories were essentially identical. That was a surprisingly freeing experience for me. Interestingly, because I found myself in one of the extreme positions during the casting exercise, I ended up as one of the characters written to be a really terrible person. But when I saw the actual memories, I felt they were pretty ambiguous, and I could easily imagine a situation where I was not at all a bad person (and I do think bringing my own physical attributes played a role in this impression.) I chose not to extend my contract, though I suspect if I had interpreted my character the way the writer likely intended, I would have chosen to extend it rather than return to my old life. Because this LARP has such open ended characters, there’s a lot of room for interpretation and players to invent details, so it includes a safety mechanic where players can write down any content they’d like everyone to avoid introducing through game play. This sparked an interesting conversation with the GM post-game — some players declined to receive the index cards (they felt they had nothing to write) but this could be somewhat problematic, as the process is intended to be anonymous. Fewer people actually receiving index cards can both make it more obvious who contributed what topics, and possibly make people feel pressured not to offer topics if they are aware that most people aren’t. We talked about possible strategies to avoid this, such as distributing the index cards and writing utensils before telling people what they’re for, so that people aren’t visibly declining them. After the dinner break, I played Into the Silent Sea. This LARP (by Paranoid & Crotchety) won third place in the Iron GM at Intercon R, when the ingredients were sea stories, metamorphosis, and math, and the prop was a wooden shaker egg painted silver. I knew very little going into the LARP, as it is an amnesia game, but I had heard good things from previous players and was excited to play. There’s not much I can say here, as with most amnesia LARPs, the LARP is highly spoilerable. I can say the premise, which is slowly revealed over the course of the LARP, is very original and creative, and the highlight of it for me was my emotional relationship with some of the other characters, as I jumped to conclusions about what they were, then realized my mistakes and had to readjust multiple times throughout the LARP. I also liked the opening scene, which has the characters positioned in unexpected ways (eg about to kiss, fainting, or struggling for control of a steering wheel) to open the LARP with a confusing bang. There is also some GM-provided costuming pieces for most of the characters — headbands with felt ears — that I thought were particularly adorable and rather effective for the purposes of the LARP. Late on Saturday evening, I went over to one of the local’s houses, where the RPI community sometimes gathers to hang out, and enjoy some drinks and a hot tub. This has become a common thing for the Bubbles and other LARP events at RPI, but this is the first time I made it there, (and I think for a few reasons, the change in location from the campus to the hotel is to thank.) I had a nice time discussing some upcoming LARP events in the hot tub. I also met a lovely cat and found out that one of the attendees was a competitive ballroom dancer in college, and hopefully this will lead to more dance-centered LARPs in the future. On Sunday, I played in my last LARP — Before and After Silence. To be honest, I found the blurb somewhat confusing and really didn’t know what to expect, but I was intrigued. The workshop turned out to be about experiencing periods of silence, and then discussing things with the group like how it felt, what might have been challenging about it, or what effects it had on us. For example, several people closed their eyes for the periods of silence, even though it wasn’t required. Others stated the silence felt awkward or anxious, or made time seem to pass slowly. Personally, I realized I was pretty comfortable with silence, so long as it’s intentional. I also realized I have pretty good hearing, as I noticed the very faint beat of music that was playing on the lowest possible setting, which no one else noticed until another song with a louder beat came on. The main part of Before and After Silence involved taking cues from two decks of cards — one, giving you a description of yourself and the group of people/situation you are in, and the other an instruction for a particular action to take. We pantomimed our various cues, and inserted our strange actions into our scenes. Over the long period of silence, the actions and emotions slowly petered out, and by the end, we were mostly sitting quietly by ourselves. I wondered if a little more structure might significantly change the experience. There’s something to be said for a minimalist structure in this kind of abstract LARP, but by default, the descriptions of groups/situations were mostly not compatible, and so we tended towards concluding “these other people are acting incomprehensibly crazy, and I don’t know what to do with them” over the course of the gameplay. For example, one character was experiencing the silence as people waiting in a hospital, waiting for test results, and found the characters acting boisterous and silly and trying to touch the ceiling to be nonsensical. My other sewing project for Dice Bubble 2019 was a set of banners for the dark romantic fairy tale LARP, The Dance and the Dawn, which features the Court of Ice and the Court of Ash. I was commissioned to make some set dressing for the LARP — two ice themed banners (blue hearts under snowflakes on a gray field), and two ash themed banners (gray hearts over red stripes on a black field, with a flame symbol over the hearts). The snowflakes were tricky — I learned a bit from the process of making the first one, so the second snowflake came out a bit better. Instead of solid fields, I picked fabric with some subtle texture — white branches for the ice banner, and a sort of charcoal effect on the background of the ash banners. I think they came out nicely! The room The Dance and the Dawn ran in turned out to be the Library, a very nice room which didn’t really need the banners, but I think they’ll be a nice touch for future runs that might have plainer spaces to run in. I like to think creating set dressing is one of the ways I contribute to the local LARP communities. Dice Bubble 2019 was an experiment in location, and I think it was a successful one. I think having one event at a nicer location, and one event at the free location is a good balance for this community to strike. And on a totally random note, I ran into Lewis Black in the hotel elevator. There’s always something slightly surreal about the period of time immediately after the end of Intercon… it’s the con I spend the most time prepping for, in part as someone involved on the staff side of things, in part because sign ups for LARPs happen well before the actual event, and in part because my Intercon related projects were particularly numerous and time consuming this year. The last few weeks have been overrun by Intercon prep, and my con experience itself was wall-to-wall busy… It’s hard to really accept that Intercon S is over. Of the nine pre-Intercon projects I listed in my previous post, I got to all of them. I was most concerned about simply lacking the sewing skill to finish the Dragons costume, and the dragon appliques ended up getting added with spray-on glue in the hotel room, but I did finish it. I managed to read and score four of the Iron GM games. One of the three large LARPs I was going to stuff got done before I arrived at the day of stuffing… which was very good, because it took four people 11 and a half hours to stuff the other two. My Intercon weekend started with my Ops shift — my first official Intercon Ops shift! But since the thing Intercon needed the most at that time was people to build the space dividers, I spent the hour in the room across from the Thursday Ops location, connecting pipes and covering them with black plastic tarps. Next, it was an evening of discussion and presentations with Forum@Intercon. It opened with a discussion on “Disability and LARP“, in which we talked about the various ways disabilities can interfere with LARPing, and how our communities can better accommodate LARPers with disabilities. We talked about issues that have cropped up in our communities (such as LARP sites lacking in accessibility), and great ideas we’ve seen used in the past that could be more widespread, such as using fonts that are are designed for people with dyslexia, and providing written materials in ways that are compatible with vision impaired technology. At one point, we talked about writing player disabilities into character or setting background information, to give them in-game explanations, which was a controversial topic — the group seemed in agreement this should happen only when a player proactively requests it. After “Disabilities and LARP”, I ran a short discussion on “Polyamorous Romance in LARP“. I opened by asking everyone to define our terms — what do we mean by polyamory? And I had to interrupt the process of creating a definition fifteen minutes in, pointing out that we had half an hour total for this topic and had spent half the time on the definition. We moved on to talk a bit about why we don’t see much polyamorous romance in theater LARPs (especially if polyamory isn’t actually the major theme), even though a large percentage of Intercon attendees are polyamorous. This lead to a discussion on “monoganormativity”, especially in historical and fantasy settings, and how we view romance as a plot or source of conflict, and how that jives with our perceptions of the differences in conflict in monogamy vs polyamory. (The classic example being, if your “romance plot” in a LARP is based around being in a love triangle and having to choose one potential partner over another, would the option of polyamory short circuit that conflict?) I think the conversation could have kept going for a lot longer if not for the time limit, and I may bid this topic again for NELCO or something. Next up was “Write What You (Don’t) Play“, a discussion on how play styles can vary a lot from individual to individual, and we often design and write LARPs with our own particular play style in mind. We went over a series of questions designed to help identify our own patterns and then see how they affect our LARP writing and design. Questions included things like what do we do the moment we get a LARP character, and how do we like to prepare to play LARP characters. I realize a lot of my own play style revolves around trying to identify and go along with the writer/GM’s intentions, and/or trying to get a sense for expectations based on the genre of a LARP and its related tropes. After the powerpoint presentation, we had a short discussion on immersion, and I was interested to see how diverse the list of things that broke immersion for various members of the audience was. The list included physical discomfort, boredom/lack of something to actively engage with, math, and mechanics in general. The last event of the evening was my own powerpoint presentation, titled “And On the Seventh Day, We LARPed“, on running LARPs for (or with) LARPers who are shomer Shabbat or shomer kashrut. I was pretty nervous, though I had practiced it twice for an empty room, but I think it went alright over all. At one point, I accidentally re-opened a video clip from The Big Lebowski instead of pausing the video, so I tried to pause it again… and again… and about eight or nine new tabs popped open, all playing the clip just slightly out of sync with one another. (There was Walter Sobchak, shouting “SHOMER SHABBAS… shomer f’ing shabbas” from multiple windows.) It was pretty awkward, but at least everyone had a good laugh. After the last Forum@Intercon event, I went over to see how Thicker Than Water was going, and I managed to catch the last of the singing performances, which was very nice, before assisting the GM with cleaning up the extensive set dressing. On Friday afternoon, I might have gone to a few more Forum@Intercon events, but players were showing up early to Kingsword, which I was aGMing, so I handed out character packages. I think overall the run went quite well. In this run, Camelot ended with a High Queen (and Ireland and Cornwall ended up under the rule of queens as well.) I wish I had been more helpful as an aGM; if I help run this LARP again, I’ll be sure to do more reading in advance. My roles for this run were mostly brief NPC roles and trying to run the combat system. It was designed to be used with electronic devices so that players find out in the middle of mock-combat if and when they fall, but the devices (designed to help find lost keys and such) weren’t working. I improvised, but it wasn’t as smooth as I would have liked, especially because it wasn’t easy to adjust on the fly if characters’ combat scores changed right before the melees. I think I might need to figure out a different system should I aGM Kingsword again. I had a costume for my NPC roles, but we had some last minute replacement players, and I offered my red and white tabard to the new King of Ireland, and I’m happy that I was able to do that. I’m currently neck deep in Intercon S prep, but I feel I shouldn’t allow that to cause me to neglect this blog again, so here’s a summary of my various projects. This is probably my biggest, most difficult project. I was cast a Targaryen, and this LARP is the excuse I’ve been waiting for to go all out on A Song of Ice and Fire costuming. 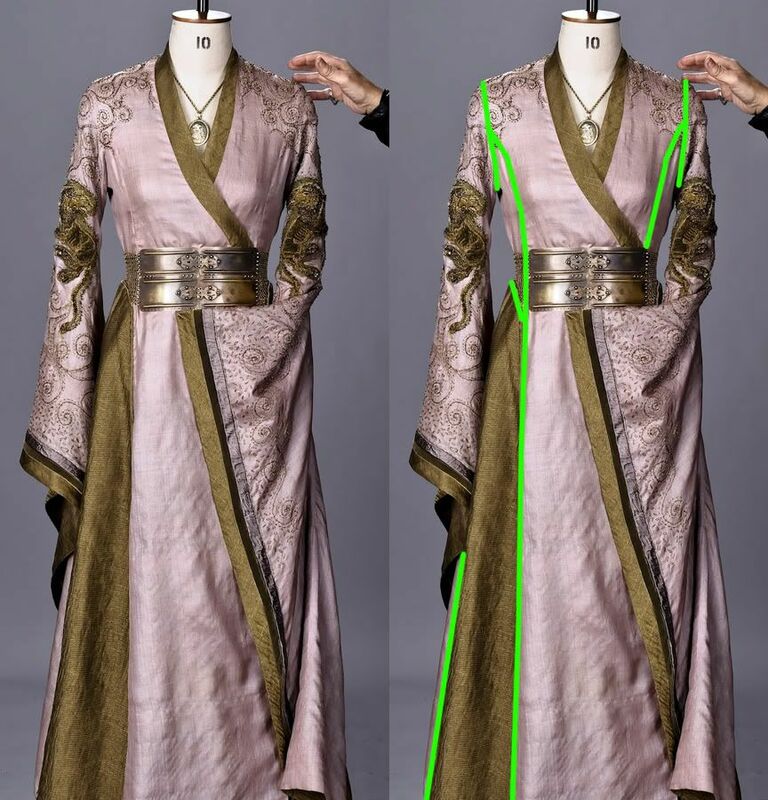 I picked up a sewing pattern clearly inspired by Cersei Lannister’s costuming (even though it’s a bit above my skill level to reliably follow) and red and black fabric. The dress is about half done. I’m proud of myself for having started this early enough that I won’t be scrambling to finish last moment. It’s slow going, as I’ve made some pretty significant errors in the cutting process (getting more of the fabric I chose has been its own saga, as I’ve bought the end of bolts three times.) But it actually does look really… dragon-y. The main fabric is a faux-leather with a hexagonal pattern that does strongly resemble scales, which I picked because a lot of Danaerys Targaryen’s costuming in the TV show has subtle scale-like texture. The accent fabric is a bold red and black jacquard, which has a nice, dense body to it… I’m almost wondering if it’s possible for a Targaryen costume to be too dragonish. Part of me is wondering if I should have gone for a plain black fabric and just added some of the scaly fabric to the shoulders or something. I’m also playing a one-shot boffer LARP based on He-Man: Prince of Power and She-Ra: Princess of Power. (This franchise as a LARP setting really tickles me. I was cast as Bear-at-Arms, (a play on Man-at-Arms.) I bought some stretchy brown fuzzy fabric to sew into two long tubes for my arms. On the one hand, this is one of the best costuming prompts I’ve ever received. I can go as literal or abstract as I want. On the other hand, I received my costuming hint a little on the late side, and the half finished Targaryen costume needs to take precedence. I went back and forth on this, dreaming up designs then telling myself sternly to reign it in. I think I settled on a compromise that is extremely literal — a blue cloud print and a rainbow sash. It might be super tacky looking. We’ll see. I’m making 13 banners for set dressing for this LARP, much like the ones I made for Kingsword. They’re simple in structure, but kinda time consuming to produce, but I’ve got about half finished so far, and the rest are about half done. To help the GMs/writers save time on producing this new LARP, I volunteered to do some editing. I mostly edited stuff that was public knowledge. I did end up getting some minor spoilers, but sheets went out today, so I’m glad I was able to help. Another last minute volunteering thing — Iron GM needed a few more readers. I’ve read and scored three of the submissions so far. Sometime early next week, I’ll be assisting in the stuffing of Kingsword, Dance of the Dragons, and Thicker Than Water. Haven’t started these, but there’s only a few to do this year. I can’t believe how soon Intercon is! I gotta get back to work.